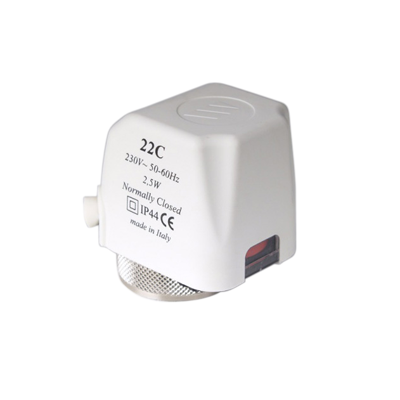 Watts Electrothermic Actuators, series 22C, are ON/OFF devices used for automatic actuation of each of the valves. When mounting the actuator on the valve body, the valve plug shuts off the flow of fluid (normally closed version/ NC). When voltage is applied, a linear movement of the thermostatic element causes the valve plug to open, which then allows the fluid to flow. When the voltage is removed, the valve plug is closed again. Availability to check status of actuator by transparent window on the cover. HotFloors have been selling water underfloor heating for over 15 years. We have experience, confidence and stability in what we do. We have invested in a state of the art warehouse south of Manchester with stock availability ready to go. We're in this for the long haul to ensure you get 100% customer satisfaction. This website is protected against copyright. Copyright	© 2019 HotFloors. All Rights Reserved.